On January 29, 2019, Minister of Foreign Affairs of Lithuania, Linas Linkevičius, visited the Memorial House of Mother Teresa. 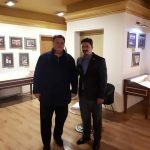 He was greeted by the director of Mother Teresa Memorial House, Arian Asllanaj, who presented him with the permanent exhibition of the museum. At the end of the meeting, he signed the book of impressions.